With approximately 85% of our churches in decline, no one disputes the need for revival. The only question seems to revolve around methodology. In the minds of many, local church revivals are a thing of the past. Evangelists are an endangered species. As a veteran evangelist of 35 years, we are still seeing more professions of faith in a Sunday-Wednesday format than what 98% of our churches will baptize annually! I find this to be true in Arizona, New Mexico, California and other non-Bible belt states as well. Indeed, the Voices of Experience listed below go far in validating the legitimacy of evangelists in today’s society and the continued relevance of this time-tested methodology. Our ministry offers a thorough preparation manual designed to maximize potential for the week and will alleviate pressure from the pastor by delegating assignments to key laymen and staff. Through the years (and I say this with utmost humility) many have described our prep materials as the best they’ve seen. As a revivalist, it should be noted that my gift-mix is not confined to drawing the net evangelistically. I have a deep burden for the complacency and lethargic spirit that dominate so many of our churches. Thus, a balanced approach in challenging the church as well as targeting the unbeliever is utilized during our meetings. In pre-crusade consultation with the pastor, it is not unusual for three out of the five sermons to be directed toward the church. However, every church has its own culture and mindset. Weekday services may not be the option of choice. I am flexible. Friday-Sunday, Sunday-Monday… whatever works best for you. Keep in mind, though, an important dimension of our ministry is school assemblies. A weekend-only format often eliminates or reduces the effectiveness of any youth emphasis. Upon reading the comments from the pastors below, I want to be quick to point all the glory to our Lord Jesus for whatever good has come from these engagements. He is faithful! Likewise, I am deeply grateful to these pastors for attaching their names to our ministry. I believe that God can, and will, do the same in your fellowship as we partner together utilizing the tools He has entrusted to us. Pastor Geoff Lacefield; Cloverleaf Baptist Church; Louisville, KY.
Rev. Steve Ballew, Trinity Southern Baptist Church (former pastor); Casa Grande, AZ. Rev. Tim Burgess, First Baptist Church; Mt. Vernon, MO. Rev. Rich Jenkins, Macedonia Baptist Church; Springfield, MO. Dr. Spencer Ray, First Baptist Church; West Plains, MO. Dr. Mark Pitts, Village Meadows Baptist Church; Sierra Vista, AZ. Dr. Toby Frost, Former Event Evangelism Manager; North American Mission Board; Alpharetta, GA.
Rev. David Brown, Hillcrest Baptist Church; Lebanon, MO. Dr. Don Cass, Former Director of Evangelism; Southern Baptist of Texas Convention; Euless, TX. Dr. Michael Catt, Sherwood Baptist Church; Executive Producer, Facing the Giants, Fireproof, Courageous; Albany, GA.
Dr. Kevin Hamm, Gardendale First Baptist Church; Gardendale, AL. Dr. Jim Palmer, Miles Road Baptist Church; Summerville, S.C.
Rev. Ronnie Walker, former pastor of First Baptist Church; Belleview, FL. Dr. Herb Reavis, North Jacksonville Baptist Church; Jacksonville, FL. Dr. Bob Hall, First Baptist Church; Beebe, AR. Dr. Bill Harrell, former pastor, Abilene Baptist Church; Martinez, GA.
Dr. Richard Harris, North American Mission Board Ambassador; Retired Vice-President; Alpharetta, GA.
Rev. Larry Holland, Former Pastor; Franklin Heights Baptist Church; Rocky Mount, VA.
Dr. Ralph Jenkins, Pastor; Cartersville, GA.
Dr. Forrest Sheffield, Pastor; Tupelo, MS.
Dr. Michael Palmer, Pastor; Roanoke, VA.
“I have known Dr. Steve Hale for 12 years. 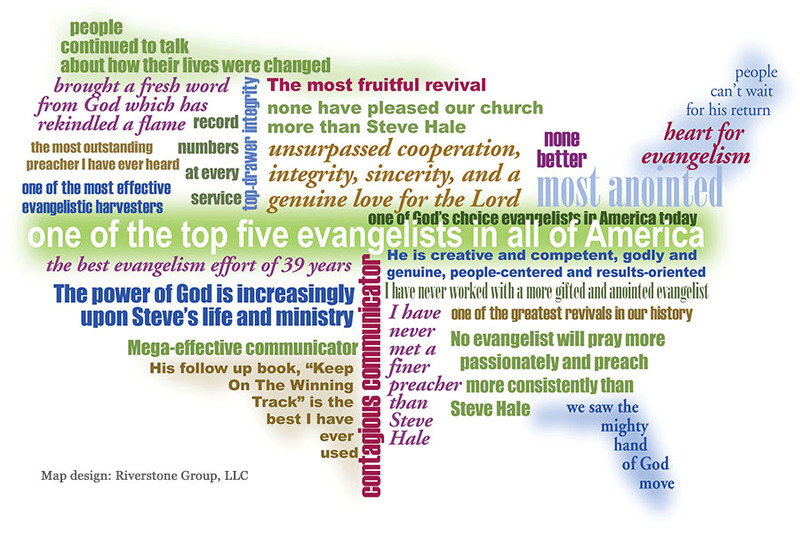 As both a pastor and interim pastor, I have had the privilege of hosting Steve for two revival/evangelistic crusades. In both cases I have found Steve to be a terrific resource for the local church. In my last revival experience with Steve, he put us ahead exponentially. By that, I mean the healing in our church and decisions for Christ gave us a jump start. I think we are now much better prepared for God’s vision to be fulfilled in the future! Steve is a man of deep integrity. His communication skills are outstanding. He has a special gift to relate to both youth and adults. Interestingly, he has a “double-barrel” ability to reach the lost and see Christians revived. I would call him an “evangelist” and a “revivalist.” His skill in being comfortable in the school settings is remarkable. His understanding of the challenges of the local church in this era is notable. Without hesitation, I recommend Dr. Steve Hale. On a side note, as a journalism major from his college days, his writing ability is exceptional. His plethora of materials that he has produced in book and CD form are invaluable additions to his speaking ministry. Dr. Bob Horner; Dahlonega, GA.